I had a very poignant Hands Free moment yesterday. 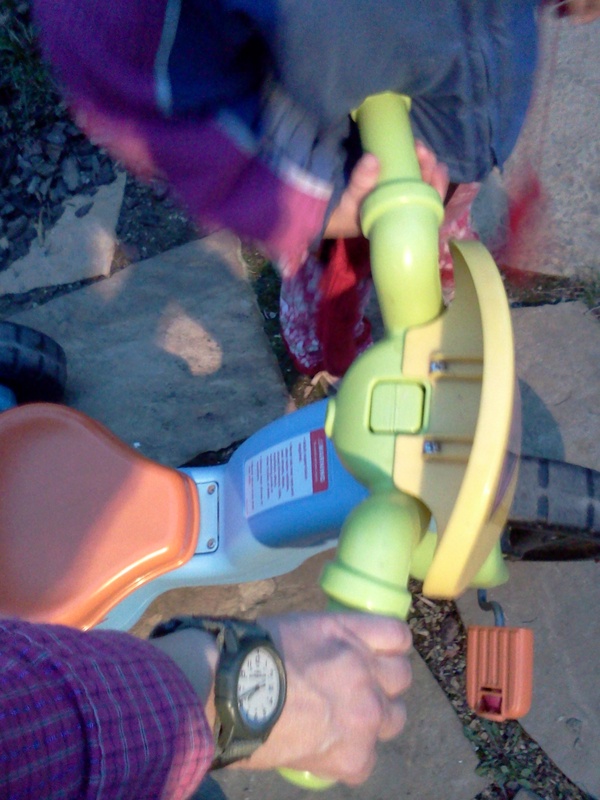 However, no phone in hand, I was there for the moment when she put her hand on the left handle of the big wheel and I had my hand on the right handle. Together we pushed it down the alley. This may seem like a pretty insignificant event but to her it was HUGE. She looked up at me at the moment we started working in tandem and had the MOST satisfied and overjoyed expression on her face and the biggest smile in her eyes. Language is pretty new to her and she clearly didn’t have the words to express just how she felt in that moment. It was a moment when she realized that there weren’t only two options in life (either she does it or Momma does it) but that there was another option: She and Mommy could doing something TOGETHER! She had the epiphany that we together were conquering this Big Wheel and that we were joined both in action and physically by the trike itself. She was so happy that she squealed and screamed the whole block that the alley spanned while staring at me the whole time. We walked the whole way home with her on one side of the Big Wheel and me on the other. Her screeching and squealing reminded me of when she was an infant. She would oftentimes spontaneously squeal in joy when life was good. Her father thought she was the happiest infant he’d ever encountered. I realized at that moment that those infantile squeals were the depth of her personality. And here I was, hearing her shriek again. But this time she wasn’t an infant, she was a toddler who can talk but who was so happy to be doing something with her mother that she was speechless. The joy overcame her and it was all she could do to contain herself—all she could do was grin and squeal. ← If you don’t advocate for your child, who will? Great story. Way to notice what was happening! And stay open. Life is good!